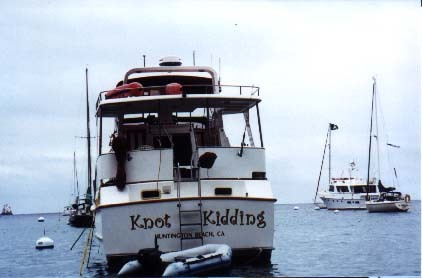 Welcome to Knot Kidding our 42' CHB Trawler This is FunCharter.com - where you will find the best Southern California boat and yacht charters for fishing, diving, weddings, parties, and more! 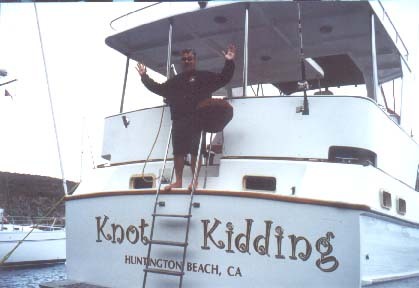 This was Knot Kidding - our 1983 42' CHB Heritage Trawler. She belonged to Ed and Peg Chmiel. It was sold in 2006. This photo was taken at the survey. 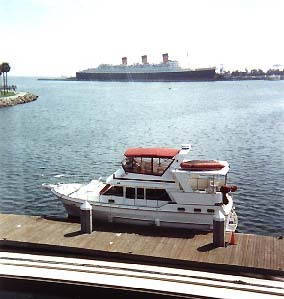 Is it bigger then the Queen Mary???? 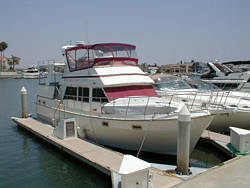 To see the boat ad as it appear in www.yachtworld.com (great site! ), click here. Note: We didn't keep the Jacuzzi! I have received more info from the mailings here than I can tell you. The advice and stories are great. Well worth getting on this group if you have any interest in the CHB line of boats. CHB Pilot. Great info on CHB's, maintainence, what to look for when buying, etc. CHB Web Site Reference. An easier way to browse the message archives. 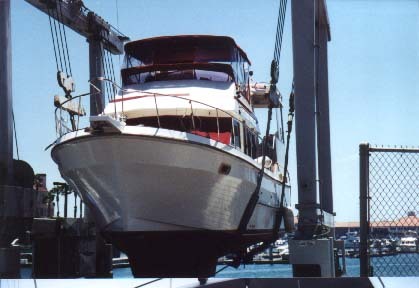 Got a 42' Present Sundeck? Well you have a great hull design, it is being resurrected as a Symbol 42 Motoryacht. Download the article here (25mby, pdf format). CHB on egroups: Click here. Here's a simple way to calculate your GPH at any RPM. It came from a great article about how to calculate your GPH (gallons per hour). It's by Mike Carson and appeared in the April 1981 issue of Motor Boat and Sailing. But, I have condensed it down to the "meat" for those of you who just want to "get it done"! There is a link on that page to the full article if you want to get it in its entirety. I did a rough calculation of Knot Kidding, click here to see the graph.. Actually, in practice, we average 4.5 - 5 GPH, including some generator use. Not bad!! !